YS, Good to hear from you. I thought you were enjoying the 70s-80s. ?? You need to build a "pond" fed by your roof. What is your water bill this summer? I've reduced my usage to 70 percent of last year by pulling up some water-gulping ornamentals and have planted only 3 of 10 veggie beds. I also haven't watered 14 fruit trees since April and my bill last month was$170! August is usually much higher because I have to increase irrigation by as much as 30 percent to keep up with the hot weather. Posting some photos that I took on July 7. 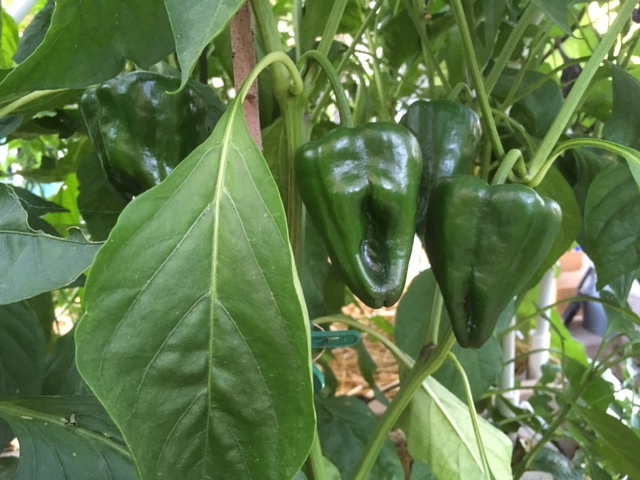 We are in another heat wave and some of the plants looked a little beaten, except for the peppers. The cucumbers, Muncher and now Pickling, look half dead but they are still producing. :-) Four nice looking cantaloupe hanging from the trellises. These Pablamos have now been picked. Here are 2 views of the amended dirt strip down the side of the house. It was getting hard to squeeze down there. Much of the corn fell over and was removed yesterday. Sniff! The okra, sorghum and sunflowers are doings fine. 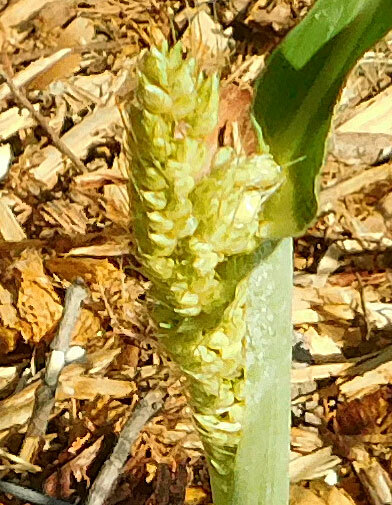 Sorghum tassel. 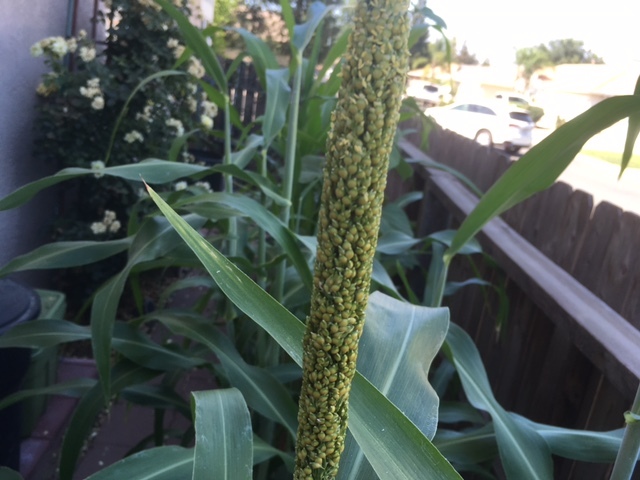 Corn and sorghum look so similar until they send up the tassels. Eggplant - Japanese Millionaire. I picked 4 yesterday. Mortgage Lifter, first time trying them. Ooo, nice, Sanderson. I will be following your progress on sorghum. 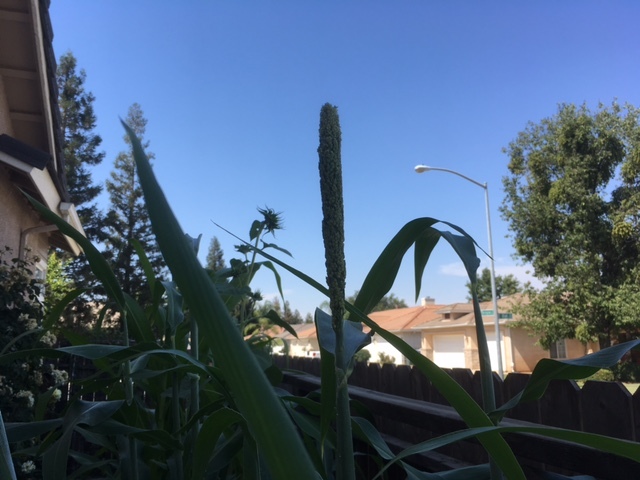 I planted mine about a month after you did, so mine are nowhere near the tassel stage. Now I know what to look for. thank you. could you take a picture showing how you are using them? you seem satisfied with using them over snap clamps. I may need to change or incorporate them into my garden tool arsenal. those peppers look beautiful. My cucumber looks dead, but perk up in the evening. can anyone share what going on? I thought they were a summer crop that can take the heat. Sanderson-san, what do you use the sorghum for? CC, They look similar, but Sweet 100 goes ahead and turns red. I also have both growing. I like the Sun Gold when they are almost orange but the Sweet 100 when they are still yellow. Has-san, the sorghum is for fun. It was either going to be sorghum or commercial hemp. 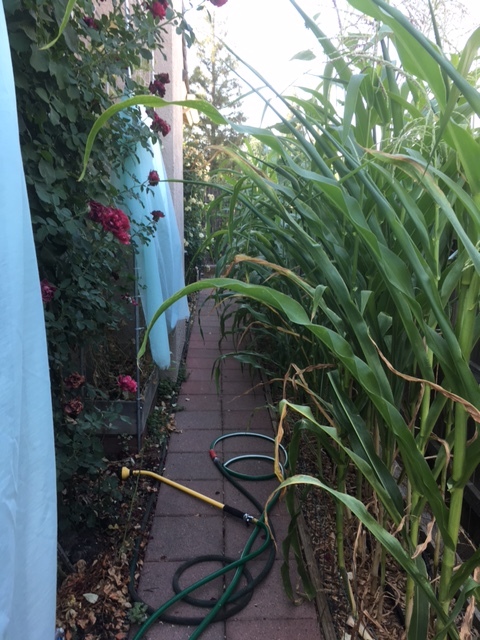 It, along with sunflowers, corn, and now the tomatoes, are visible from the sidewalk. Big binder clips to secure material to 1/2" PVC or EMC, or to weigh down material. Little clips to secure rolled-up ends of fabric. 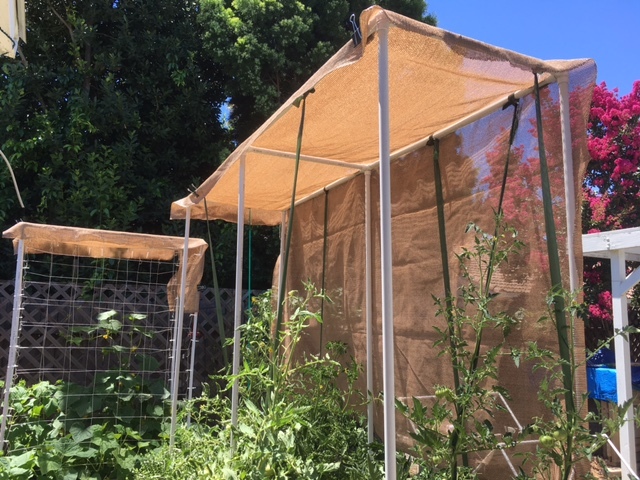 For securing shade cloth to frames. 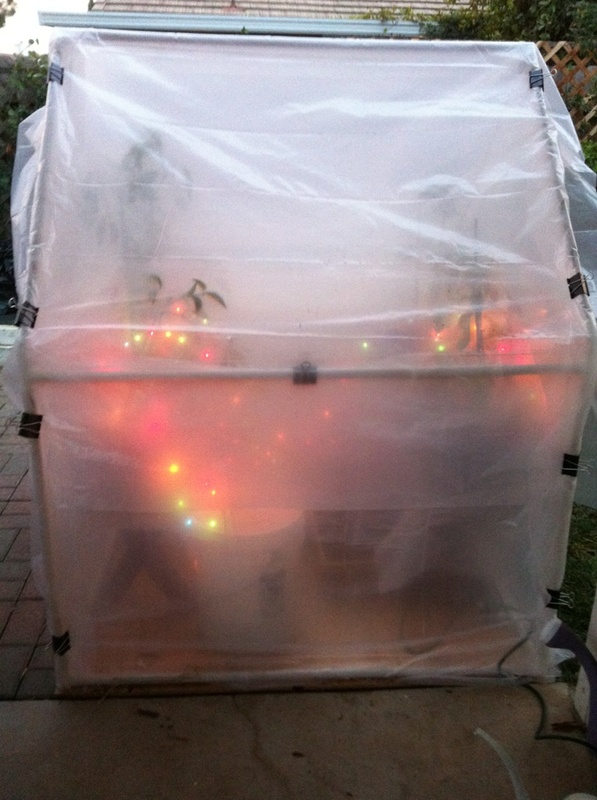 Also, to secure the large overhead shade cloth to para-cord. The small ones (or maybe they are medium ones?) work fine for the shade cloth. I use the big ones to hold 2 pieces together (pictured) or to prevent the shade cloth from slipping left or right. For securing 4 mil plastic to frames. 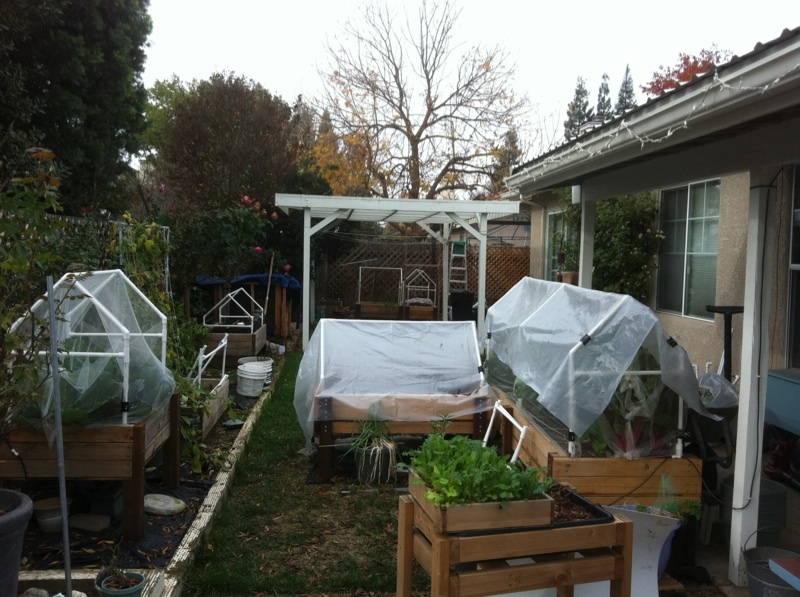 I no longer use plastic except for the little green house or for hail or bad storms. This message is brought is brought to you by Office Depot, purveyors of fine binder clips. Sanderson: I use those binder clips, too. Very handy. Found a thumb-sized fuzzy cantaloupe today -- doing the happy dance. Planted out 18 blackeyed pea plants in 2 huge containers in the Salad Bar. Now it's too hot, so I'm inside in the a/c. Here's praying for that little cantaloupe! 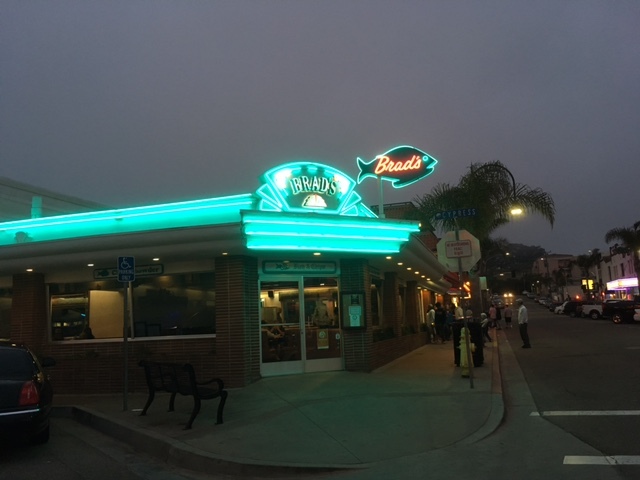 I don't want you to get jealous, but we are going to Pismo Beach For an overnighter. Leaving Thurs morn, returning Friday eve. An escape from the heat! I am hoping to wear my heavy Pismo beach hoodie sweatshirt most of the time. For two morning, I have been in the garden near sunrise. I finally finished chopping up the hay for mulch. I cleaned the cantaloupe and cucumber beds of lower dead leaves and applied a thick layer of mulch. The pole Blue Lake beans have been decimated by the dreaded red spider mite. Since the bird nest in the adjacent rose bush is empty, I can spray what ever I replant with soapy water or even Neem oil now. I hope to plant some beans (scarlet runners or southern beans?) in those 2 beds. @Sanderson wrote: For two morning, I have been in the garden near sunrise. That's what I've been doing, too. For my evening watering, I put on my bathing suit and get into the hot tub first, ducking under to get my hair wet. Tonight I'm going to wear my new cooling towel, too. That cools me off enough to get done what I have to do. It's all still taking its toll. I'm feeling worse every day -- no energy. I really think it's the opposite of SADD. I can't remember what it stands for, but it's people who get lethargic in the winter when there's no sun. Mellen: It wasn't at 5:30 am. Reverse SADD. 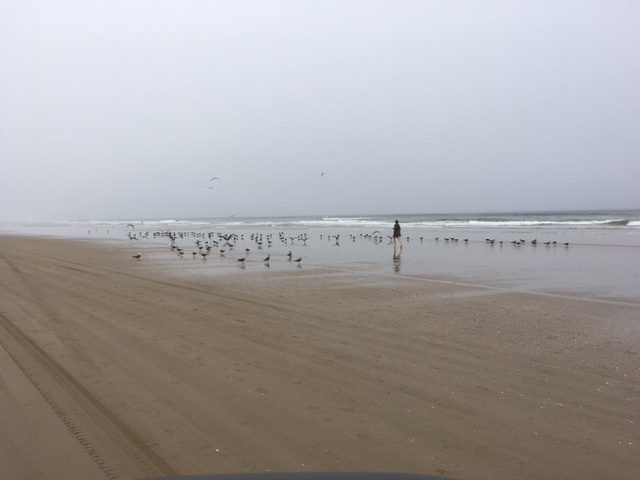 Pismo Beach with some fog. Just wonderful to get away from the heat for a day. 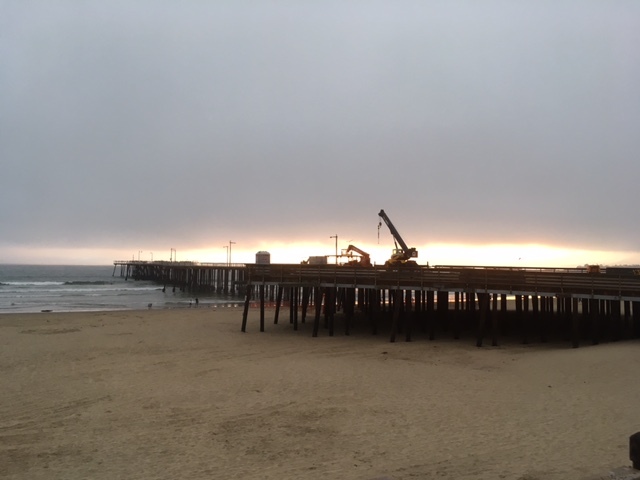 The Pier is closed for repairs. Evening. Morning. The campground further on down was booked full. The only ones in the water were fishermen in shorts and little kids chasing the tide, picking up shells, ignoring the cold. Found another cucumber! Don't remember where I posted it, but someone (Sanderson?) asked about the variety. Of all things, they're Burpless Bush (Burpee?). I would never have expected those to withstand the heat, but there you have it, ladies and gentlemen. Ooo, almost forgot -- got a tiny green pepper (CA) starting and 5 baby cantaloupes (Hale's). 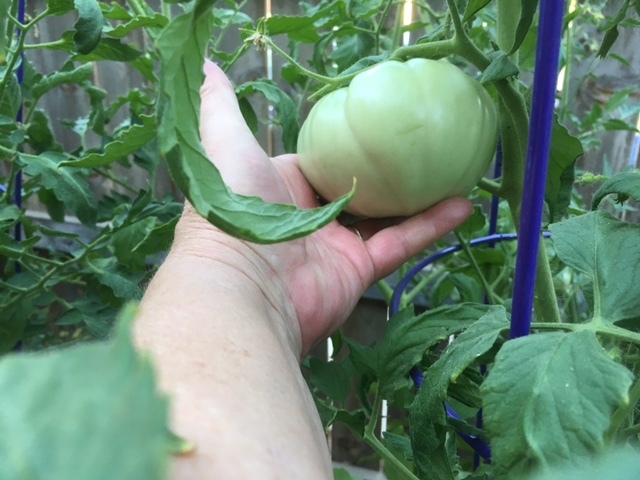 I also have one lonesome tomato plant that bloomed and produced through all the heat. 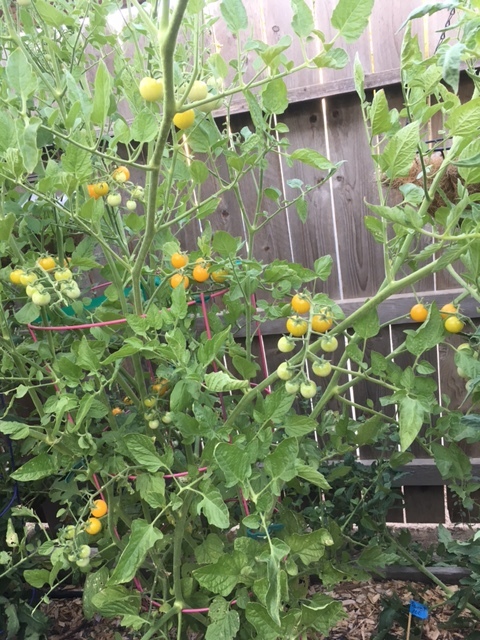 It's an unknown variety, small orange/red tomatoes, but larger than cherry. I will definitely keep some seeds for next year and to share with my tomato-loving-heat-enduring friends. @has55 wrote: Sanderson-san, what do you use the sorghum for? Did you do something fun with it? 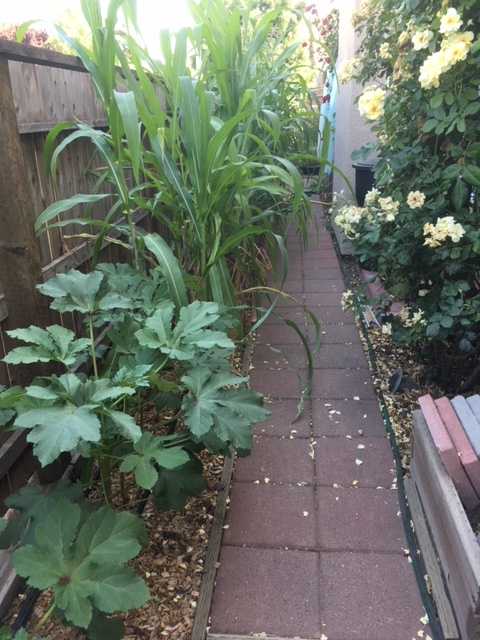 Composting, mulching, fertilizing -- trying to revive my poor, beleaguered summer garden. Now that it is below 100*F, I'm trying to get the back yard and garden cleaned. Swept and hosed the back patio. Moving supplies to the garage cabinet when they should have been all summer. 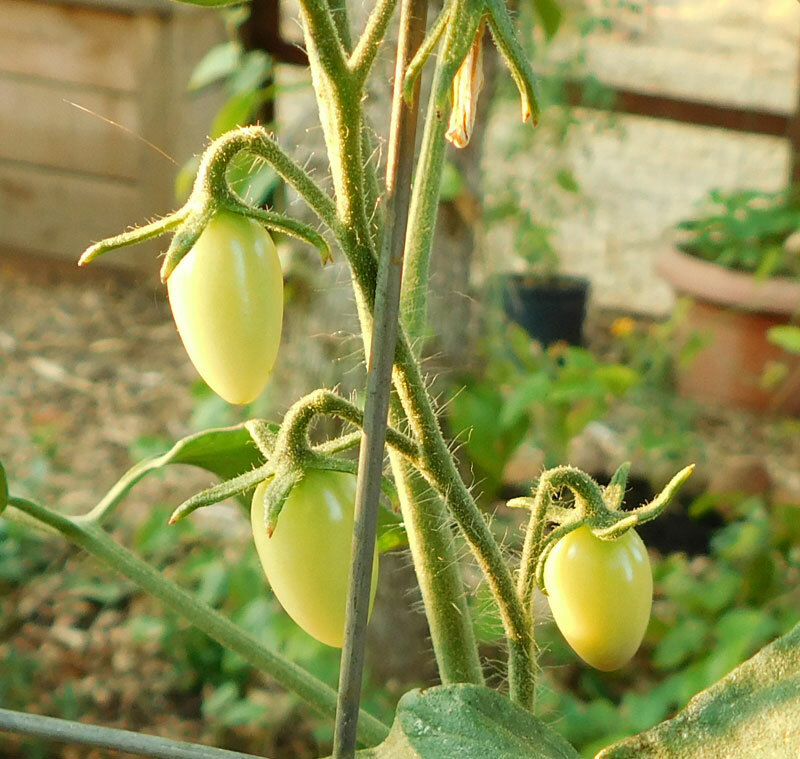 Pruning tomatoes (way overdue!) in hopes of more flowers, harvesting tomatoes that matured during the heat wave. Strung the cayenne chilies to dry outside. They are starting to "rattle". 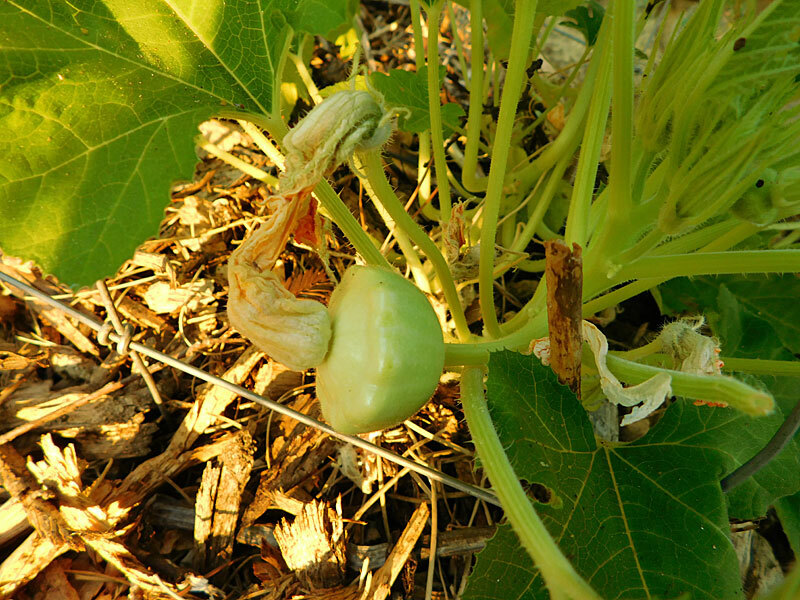 Watching a Canadian Crookneck squash slowly grow. It would be nice to have at least one this year. Steadily picking cucumbers for the first time in 5 years of SFG. Those Munchers are my winner for 2017. Made some cucumber/lime water and munched on some of the limed cucumbers. Started a new compost pile in the Lifetime Tumbler on the 5th. It is bouncing around 140-150*F. I'm turning and airing it daily. That's one of the negatives for tumblers. As you turn it, the lid has to be closed. Trust me. So, I slowly rotate, air out, repeat. Gosh, not really any exciting news. 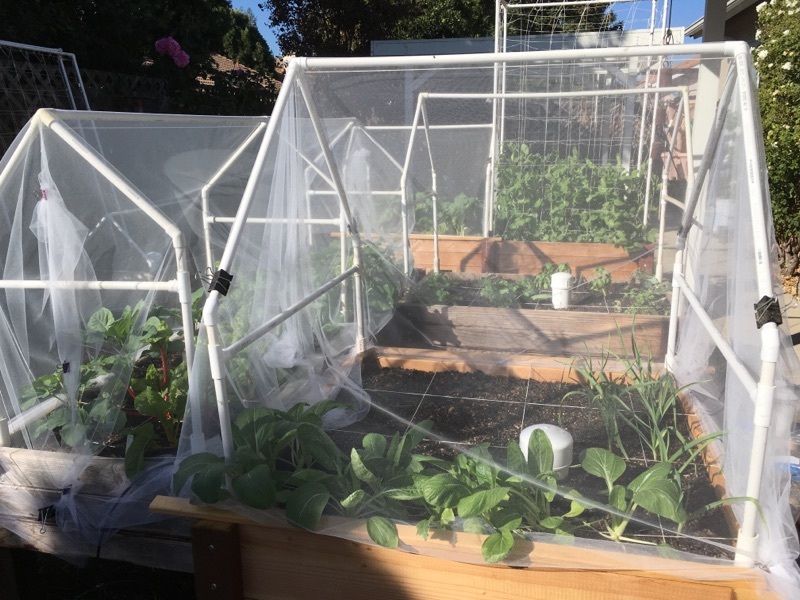 I won't be starting the winter veggies until after the Heirloom Exposition in September. I'm thinking we will attend the Exposition for one day and then drive up the coastal highway to see the craggy ocean front and old redwood forest. Cool and misty. 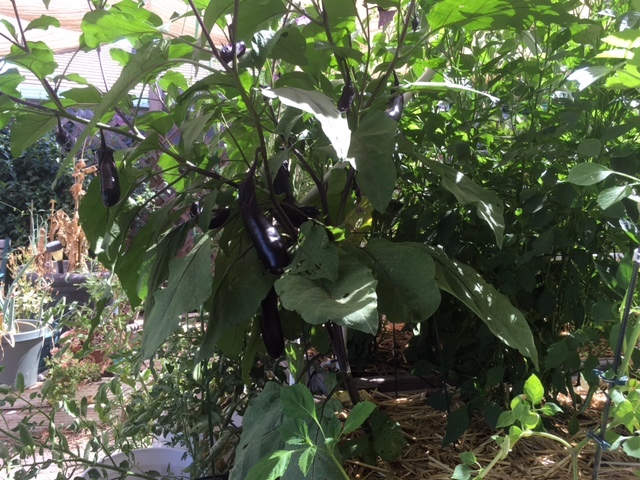 @Sanderson wrote: Steadily picking cucumbers for the first time in 5 years of SFG. Those Munchers are my winner for 2017. Cukes are my hands-down winner for this summer, too. I got a late start planting Armenians, but they came up through the worst of the heat and are now in bloom. The big surprise for me was the Burpless Bush cukes. They've been producing steadily for almost 2 months. They're crisp and delicious, too. Mine is finally starting to tassel. I hope the chickens love it. Otherwise, I won't bother with it again. Starting to get busy. 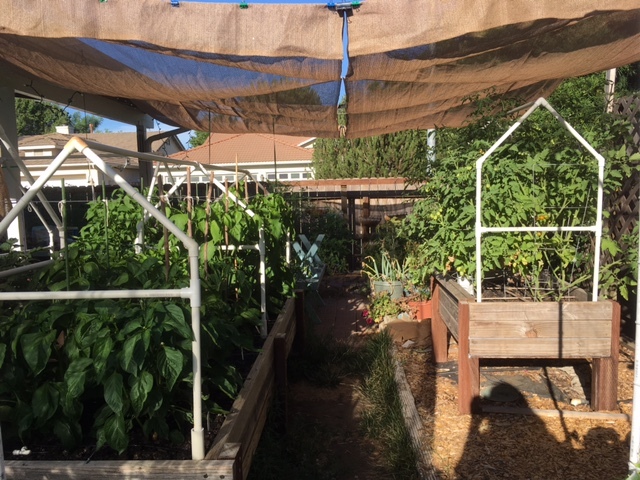 It will be a false start, since Thursday and Friday are supposed to be 104-105, which means the gardens and I will take a couple of personal days, but overall things are improving. I have enough zukes and cukes to start giving some away (well, only 1 each, but still ). We had enough asparagus beans to make a difference in a one-pot meal. I transplanted the sweet potato starts, yesterday, and today I transplanted the tromboncino squash. Today my 2nd summer seeds are supposed to arrive, so I'll get the butter beans in among the dead corn stalks. The new corn is sprouting, so I'll get that in, soon. I will also start some more tomato seeds and replant artichoke and Walla Wall seeds that have a poor germination rate -- only got one artichoke and 2 onion starts from last planting. Planting more 2nd summer seeds, today. Check out these tiny tomatoes. Unknown variety. Exactly the same size and shape as the cherubs we love from the grocery store. They also survived our summer heat. We don't care what color they turn out to be as long as they're sweet. Fingers crossed.